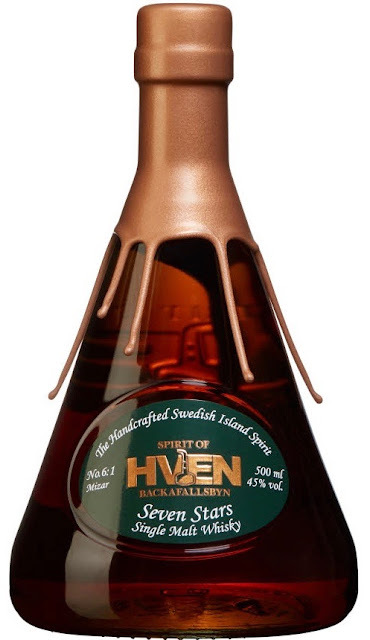 Swedish whisky from Hven Distillery – Mizar 6:1 45% ABV! Dear friends, supporters and followers alike! On the 28th of February, the swedish distillery Hven held a press-tasting for their latest release. 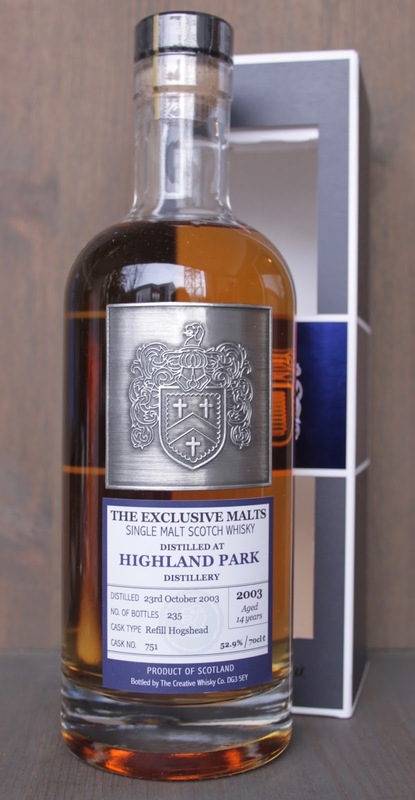 It was great to once again receive an invitation to attend, but very, very sadly I was not able to attend... To my great joy a generous sample of 10cl arrived not that long ago and so today I present to you my notes and thought on this whisky! This latest release is the continuation of the series drawing its inspiration from the constellation called "The Big Dipper". "The recipe is 58,8% Lager malt, 35,3% peated malt (38ppm), 5,9% Chocolate malt. The distillate have matured between seven and ten years on; 64,7% Muehlenbergii oak from Missouri, 23,6% Petraea oak from Allier and 11,7% Robur from Bourgogne. The whisky was married on seven Quercus Petraea barriques that previously held Chateau Margaux Premier Grand Cru. An additional seven casks with the same recipe have been kept for further finishing. This whisky will be released in September 2018. The traditional whisky phenols measures to 20ppm, however the contributing phenols from the chateau Margaux casks elevates the total phenols to 32ppm" (source). Mixar 6:1 is still available at a number of swedish monopoly stores and you can view and order it by clicking here. Ok friends, let's see what we have this time around! Sugar-y sweetness, zyrup, partly resembling the sweetness of some kind of swedish red jelly candy (zoo, boats, or ferrari bilar). Immediately below this sweetness is a grain type of spicyness that is intermingling with what seems to be the spicyness of new swedish oak accompanied by christmas tree, resin on an old spruce, and spicy but sweet vanilla. I detect no peat, no smoke, but there is plenty of candied/burnt sugar. In the very bottom layer (the base) I find roasted sunflower seeds, slightly burnt. All in all, a quite forest-y dram. The start of the nose is very interesting and sort of classic Hven. It’s interesting that I did not detect any peat on the nose. The delicate peat in the taste is absolutely beautiful and well-balanced, as well as the nice hints of (what reminds me of) oloroso sherry. Unfortunately this dram did not take me all the way because of the ”water-y” style and the lack of body. It’s in no way a ”bad” dram but in line with my preferences the whisky could’ve easily spent some more time in the casks. Hopefully Mizar 6.2 will satisfy my preferences! 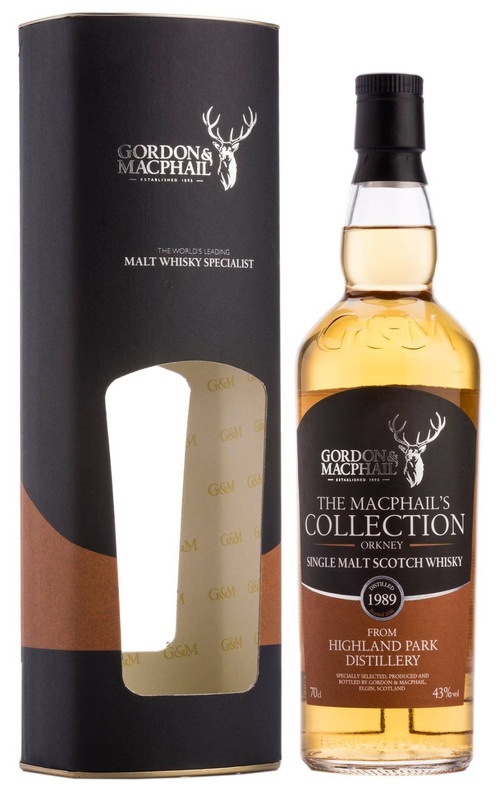 Highland Park Single Bourbon Hogshead – Gordon & MacPhail 43% ABV! Dear friends, supporters and followers alike! 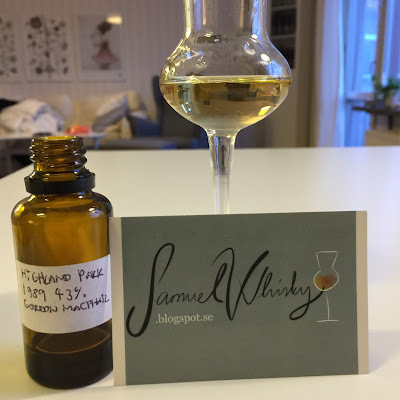 When working the Whiskyexpo in Linköping a couple of weeks ago I passed by the stand of Symposion, since I had been given the great opportunity to pick up a sample of a coming Highland Park Single Bourbon Cask for review. Here in Sweden it is released tomorrow and you can view the product here. We are talking about a 1989 (26-27 years old) single refill american oak hogshead (250 litres) that has been watered down to 43% ABV. The cost for a bottle is 2402kr and Symposion has managed to source 96 bottles for the swedish market. Ok, let's see what we have here! The centre layer on the nose consists of a very broad vanilla and butter combo with a handful of light peat. We also have classic marzipan and/or almond paste. The top layer is soo frutiy; a kind of summery feeling going on here with an elegant but attention-seeking citrus, peel from red apples, mushed red apple pulp, citrus-infused liquid honey, and hey, there’s even a touch of mint. Lots and lots of summer fruity-ness! Finally, in the bottom-layer, there is a discrete, earthy and somewhat ashy peat with hints of vanilla-infused pipe tobacco. All together a great nose! Opens up soo incredibly smooth on soft, creamy and sweet elderflower with evident touches of vanilla. This phase lasts for about 2-3 seconds to be interrupted by a quick slightly bitter liquorice/polypodium. This then quickly moves on into the longest phase of the taste consisting first of marzipan and/or almond paste but then moving on into medium-dry peat, oak/”mature” wood and a nice malt-y cling to it. It fades away with burnt peat, or rather ashy peat, in combination with elderflower juice (soft drink without carbonation). Absolutely beautiful taste! Especially so the very beginning and the very end of the taste, nice!